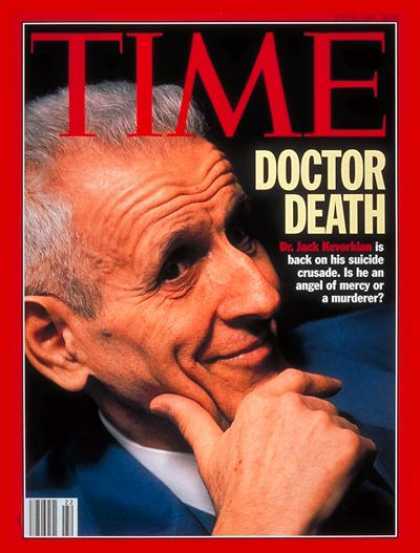 I hadn’t thought about Jack Kevorkian in many years but today I was bombarded with stories about him everywhere I surfed. I think the first account of his death that I read today was from Yahoo News. I then surfed on and happened across another death announcement on the National Public Radio site. So, I did a Wikipedia search and found another. 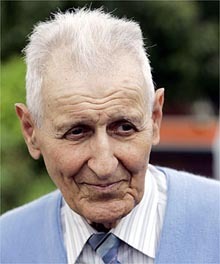 I’m filled with mixed emotions about Mr. Kevorkian just as I was years ago when he was constantly in the news. In that same stretch of years, I’ve changed my point of view on many things but not this one. There’s a nagging itch in the back of my head that wants to say that he was just plain insane…but that’s only a small part of me. For the most part, I believe he was a hero. Not only to his patients but a role model to the rest of us. I believe there was something very special about this man and it has absolutely nothing to do with the cause that he fought for. It is the very fact that he fought so passionately for what he believed in. We should all admire him for that. If the world had more men willing to stand up as ferociously and selflessly as Mr. Kevorkian, I believe our planet would be a much better place. I believe another important thing to remember about him is that as he was performing this “service” to his dying patients, he did not act in a malicious way. He did the things that he did with only love and compassion. Most of us have had the misfortune to watch someone we love suffer a long painful death due to illness. I’ve seen this first hand twice in my life and watching someone waste away, in pain, is truly horrible. One of these people knew she would soon be leaving us and was ready but determined to fight until the very last second. It would have been a crime to take that away from her. Mr. Kevorkian’s ideas would never have done that. He would have only helped those who wanted his help. I believe I would want his help in that situation and given the opportunity, I believe he would have been there to help. Those who fought so diligently against his cause fell into basically two categories in my mind; those who believed it was wrong according to religion and those who believed it was wrong due to the presidents it would set and the limits (or lack thereof) being stretched. To the latter, I say, If you can make it illegal, you can regulate it instead. As for religion, the patients themselves have the right to choose their own religious beliefs and if they choose to ignore religion in making that decision, it should be left to them. Not their families and certainly not the public or the government. For a country with separation of church and state, there sure are a lot of laws made based on emotions that surround religion.